Established in the year 1995, we, Gyanis, are leading manufacturer, supplier, exporter and wholesaler of a wide range of ladies garments. Our products are of the latest designs and are in compliance with the prevailing trends in the fashion industry. We have established a strong foothold in the industry and have gained invaluable experience for thirty years. We provide timely delivery of our products to our clients as per their requirements. We are highly acknowledged in the industry for manufacturing superior products and lay great emphasis on quality. Therefore, our products undergo stringent quality checks and take. Our products are tested on several parameters before being brought to the market and sold to the customers. Our products are extensively used and we have a vast clientele worldwide spread across Middle East, North America, East Europe and many other locations. We have the legal status of a proprietorship firm. We have an efficient team of professionals who work judiciously to achieve maximum customer satisfaction and consistent improvement in quality of our products. They strive to achieve perfection in all their tasks. We apply our keen creative sense in our quest to constantly reinvent our product portfolio. Our designs are highly revered by the industry experts and fashionistas alike. Under the guidance of " Mr. Sunny Dham", we are ahead of the race and believe in coming up with never seen before designs, that are practical and at the same time enthralling for our customers. We are highly ethical in our business dealings. To be leaders and innovators within the fashion industry (ladies garments) encouraging and inspiring new fashion trends across globe. We have provided our employees with the best in class infrastructure that help in faster processing and maintaining high standards for our products. Our designers have been given separate place for their working and we make sure that they provided with the latest designing equipments that make it easy for them to bring their ides to reality. 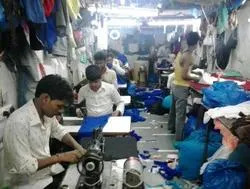 Our tailors are provided with a spacious place with the tailoring machines that are of international standards. Our equipments are given proper servicing so that there are no faults ion the machines that might lead to delays in the production. We have in our team experienced stitching professionals, experience designers and an entire group of adroit tailors who make sure that the cloths are provided with proper finishing using modern technologies and made within the given time frame. Our quality analyzers make sure that the products offered by us meet both the national as well as international standards and also ensure that the materials are procured from the best vendors in this industry. We check our products on various parameters so that the products reaching the client is best in class. Quality assurance parameters have been defined and an in-house team ensures the quality parameters have been met. Standard operating procedures have been laid out for material handling, inventory management and transportation to ensure maintenance of superior quality. Independent review by third party auditors to ensure continuous improvement and quality being delivered to client . We all know that clients are the king of the market, hence their satisfaction is must. Our aim is to attain maximum client satisfaction by providing high grade products and timely delivery of the same for which we have linked our firm with some of the best transporters in the industry who deliver the goods safe and on time. All our clients appreciate our products for their unique designs and durability. We strive to maintain this and never compromise on our standards to provide our clients with a reliable source to buy their apparels from. We offer a varied range of products with high end quality at best competitive price possible. Customized products and innovative designs are the key factors which help us stand out from the rest. However, the most important criteria are the post sales service we offer and our firm culture (focused on relationship management) where we believe in building business and personal relations.